I Played The MapleStory App For A Week And Still Don't Have Any Friends. Halp. MapleStory M is a side-scrolling MMORPG, with playable classes from the classic MapleStory Explorers: Dark Knight, Bow Master, Night Lord, Bishop, and Corsair. You will need a device on Android 4.4 or higher, a dual-core CPU, and 1.5GB of RAM. Once installed it takes up 214MB of storage, but there may be further downloads, so that may increase. I never played the original MapleStory when it was launched on PC in 2003 because I didn’t have a computer and access to the internet until 2013. So even when I had a chance to play MapleStory, it was long dead by then and none of my friends played it anymore. But they used to tell me of their endless hours of grinding, interacting with people and just general good fun. Finally MapleStory Mobile was released this year and I had to get my hands on the game that everyone played during their childhood so that I could understand what the hype was all about. If you’re someone who has played a fair share of MMORPGS (Massively Multiplayer Online Role-Playing Games), the basics are unchanged: you need to grind EXP and gold (meso) to level up and get stronger. The introductory tutorials only teach the very basics of the game, such as moving, attacking and upgrading items. They don’t tell you more about the in-depth stuff such as what gear you should look for, where to get gear, where to farm for meso and Maple leaves, and many more. If you want to be decent in the game and not look like a total noob like I was, you have to go to Reddit or YouTube to learn more. However, since I’ve done the leg work, here are some of the basics and tips and tricks I learned. If you played the original Maple Story on PC, you might or might not like hearing that don’t even need to play the game, as the game plays itself. So yes, you can expect an auto-questing system along with an auto-battle system (that’s unlocked at level 20), However, auto-battle will cost you tickets and it can run out fast if you plan on auto-ing your way throughout the game. Automating features in mobile games may be great for those who hate wasting time grinding manually, but it’s also a trick to keep people addicted to the positive gameplay loop when things move along quickly. My favorite aspect of these new features is that you can multitask. Auto-quest and auto-battle continue to run in the background while you mess around with other applications on your phone or do other things in MapleStory M. This wasn’t possible in the original game. If you wanted to level up in the PC version, you needed to sit down and grind the hard way. If you wanted to purchase things for your character, re-organise your character’s inventory, or sift through the possible accessories you can purchase for your character, you’d have to set aside time for that. Now, your character can grind and complete quests without you sacrificing your time and energy that you’d rather put into more worthwhile moments that the game offers, such as going through the trade station and working together with others in the Elite Dungeon. The other side of the game other that keeps me coming back for more are the daily missions, dungeon battles and of course Zakum (whom I still can’t beat). Completing these on a daily basis will provide you with enough meso and material to upgrade your items when needed. It’s recommended to do these 5 steps to earn as much meso as possible. Collect 350 Maple Leaves Daily: You gain free Mysterious Pouch Bags that rewards a random amount of meso. Complete Daily Missions: Completing all missions will reward a total of 120,000 meso. 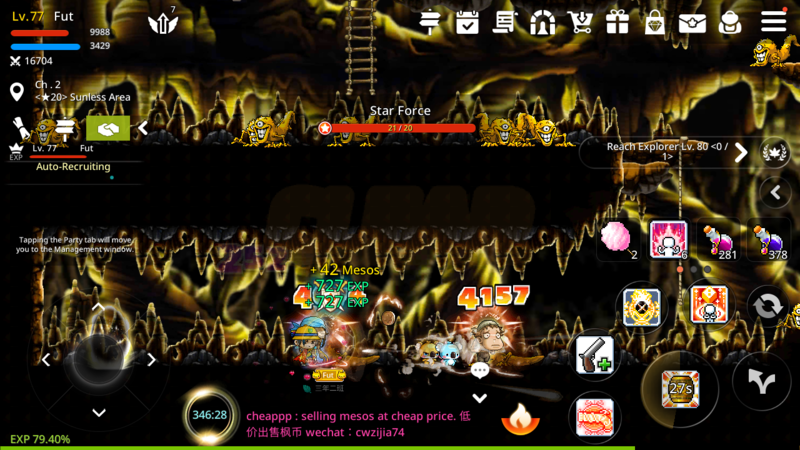 Mini Dungeon: You can farm approximately 150 to 200,000 meso for 30 minutes at Level 100. Elite Dungeon: Grind till Level 95+, and gain access to the daily Elite Dungeon. It will guarantee an Epic equipment. You can sell them for 400 to 500,000 meso in the trading section. 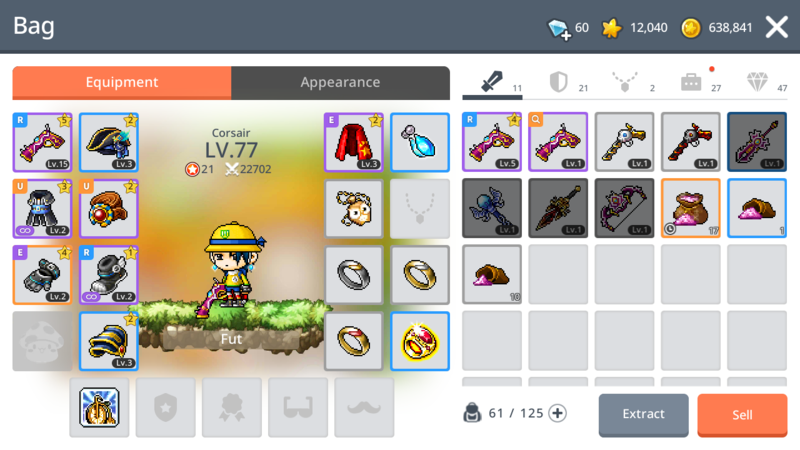 Trading Section: Selling perfect base attack weapons for 1 million meso and above. 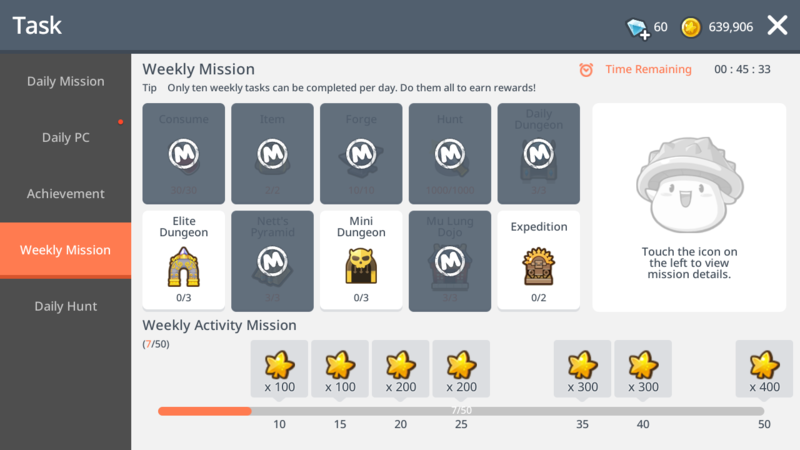 The weekly missions and rewards. Now more of in-depth tips such as getting the best out of your weapon. If you have already upgraded your weapon and it’s not max attack, fret not as you can always start again—you can buy max attack weapons for cheap in the trade station. Firstly, do not waste your meso and materials upgrading your weapon unless it has max attack. Check out this table to know if your item is capable of max attack or not. Basically you would want the best attack weapon as the end game play depends on how much damage you can do (unless you are a Bishop, and in that case you won’t be affected by how much damage you can inflict). Based on this you can also earn easy meso off the Trade Station as newbies like me sell our max attack weapons at a cheap price because they don’t know anything about stats yet. I bought my max Gun for 100,000 meso which was a steal as usually max stat weapons go for at least 1 million meso. My inventory with max gun. If you already have a weapon and it’s not max stat, try to buy a normal ranked one and upgrade from there. Otherwise, you will lose a lot of damage output when upgrading your weapon to Legendary. So remember to save up your meso or you will have a hard time upgrading! Although the auto-system is convenient, players will just turn it on and leave the game as auto even runs while you’re offline as long as you have enough auto-battle tickets. Thus the social aspect of the game is less compared to other mobile games, as people don’t need to manually do anything much. This is the main issue I have with the game as I prefer to talk to other players as that what makes the game interesting to me. No one really seems free to have a conversation or interact. I’ve said hello quite a few times, but only get ignored. 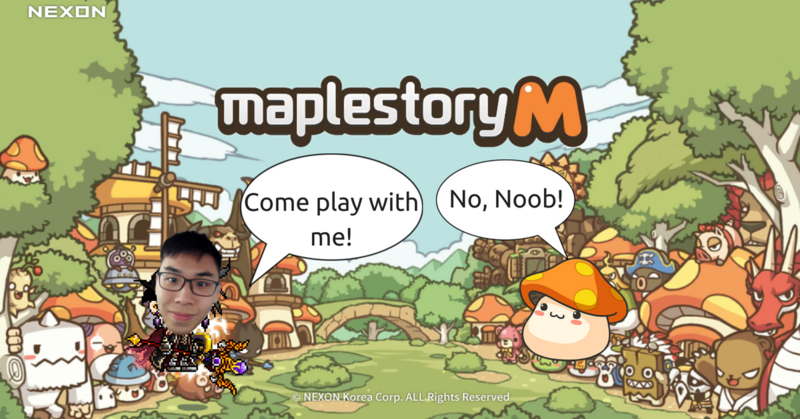 However, the funny thing to me is that despite what many would view as negative additions to the classic grindy gameplay, I’m still eager to jump into MapleStory M.
Maybe that’s just the child inside me talking, or perhaps this is one of the first MMORPGs that I missed out on and I’m just playing catch up. In conclusion, MapleStory M is an easy to play game and you can level up very fast with the auto-battle system. You won’t have to grind for it and spend so much time playing it, which I appreciate as I have other games to play too. 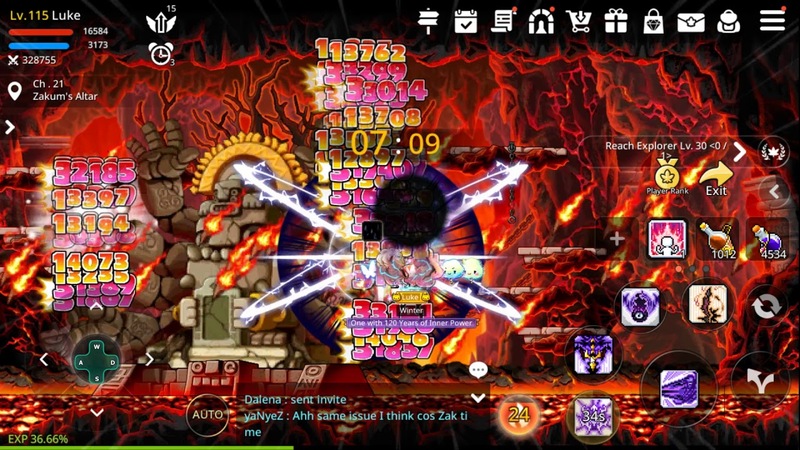 I do hope that I get more friends in the game as I love to meet new people and need someone to carry in Zakum so if you want, hit me up in Asia server 2, Croa. If you would like to download MapleStory M, it is now available on Android and Apple.